SYNOPSIS: Take a journey through time and genres and discover a past where queer figures live, love and shape the world around them. 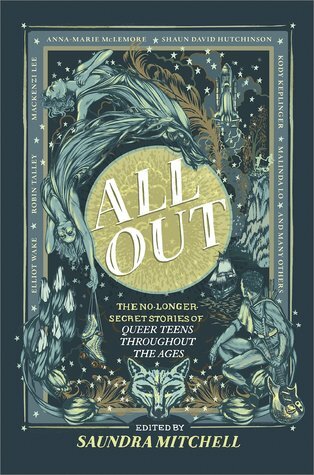 Seventeen of the best young adult authors across the queer spectrum have come together to create a collection of beautifully written diverse historical fiction for teens. I was able to get my hands on an ARC of this and I cannot WAIT to read it 😀 Great review! I’m even more excited now. Ooooh, yay! I hope you enjoy it, Flavia, and thank you! ❤ It was so fun to read a whole collection of queer characters – I need more like it! That would be really cool! Since this one is mostly historical fiction, I’d love to see them make more of them falling under different genres, like maybe a full-contemporary one, and a fantasy one… I’m daydreaming now haha! That’s a good idea! You should definitely pitch that to them 😉 I’d buy and read them all! Thank you so much! I hope you enjoy this one! Magical Realism reads are my fave, I legit have a weakness for them lol. Added it to to my TBR, I didn’t even know this book was a thing so thank you for bringing it to my attention with your review <3! They’re sooooo good! I don’t think I ever really realized how much I love the style until last year, but now I’m always looking for more work to get my hands on! ❤ And yay! I hope you love it! I’m so sorry that some of the stories were a hit or miss for you. I honestly, thought Shaun David Hutchinson’s story would’ve been better since he is such a hyped author. But, I am glad to hear you enjoyed Anna-Marie McLemore’s story, I just read her novel Wild BEauty and LOVED IT! I am also really excited to hear that there’s an ace character in one of the stories, I think we are finally starting to see or at least hear about more ace rep in books and I couldn’t be more excited! I’ll definitely check this one out! Aw, thank you, Ellyn! I thought Shaun’s would be better, too! I hear his novels are great so I don’t know if it’s his writing style not matching my taste, or maybe he just doesn’t write great short stories. I think there are loads of amazing authors (like Garth Nix!) who write fantastic novels, but awful short stories, lol! Anna-Marie McLemore is a confirmed goddess, I am SURE of it! I adored Wild Beauty and really need to get around to reading her last YA book, When the Moon Was Ours (I think that’s the name?). I also can’t wait to read her fall release for this year (already pre-ordered it, lol!). I’m also so excited that we’re seeing more ace rep lately! It’s so important. I’m not ace, but so many of my friends are, and I know it means so much to the ace community to see themselves represented in a positive light!